"Be careful what you wish for, Bradley"
Bradley is an Interactive Puppet controlled by a Kinect controller. The installation will mymic the posture of the person standing in front of it. 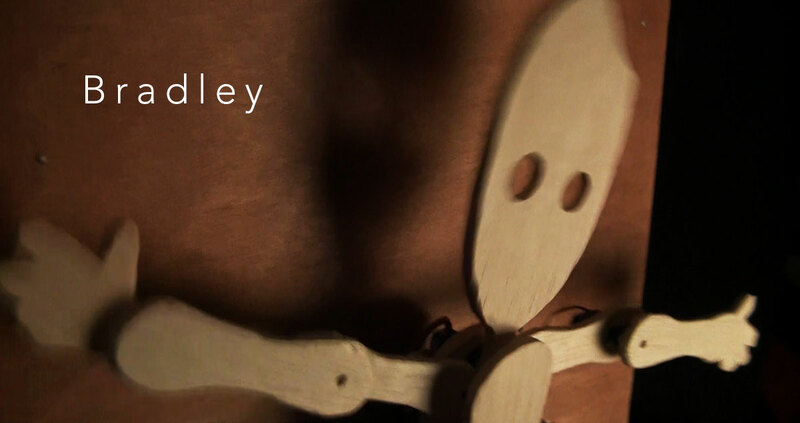 Bradleys limbs are controlled by 7 servos, that are connected to an Arduino board, and linked to an Adobe Air application. Over the past 18 months I have been experimenting with the Kinect controller and installations that present a mirror to the audience. I believe I have gone full circle now. The Kinect detects the physical objects and persons in the room, and creates data that is usefull in your computer to capture what is happening in the physical world. I now use this data and put it back into a physical installation. Watch the movie here or below on this page. Watch the Making Of here or below on this page. Bradley is created by Jan De Coster.